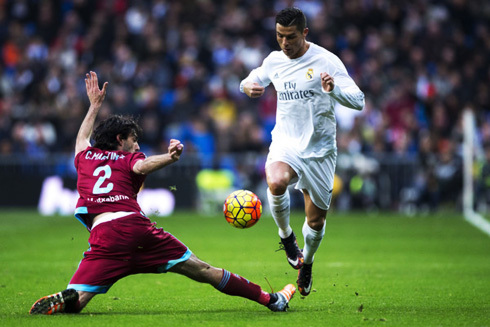 Real Madrid went through some difficulties to get past Real Sociedad this Wednesday afternoon. However and thanks to a brace from Cristiano Ronaldo and Lucas Vázquez's first goal ever for the club, the Merengues managed to pull off a 3-1 win against the Basque side. With the new year's eve coming up tomorrow, Real Madrid just had their final game of the calendar year at the Bernabéu, as they hosted Real Sociedad in a very important La Liga fixture. Rafael Benítez's men knew that a win would send them to the top of the league at least until Barça and Atletico Madrid step on later today to play their respective games and Los Blancos did grind a 3-1 win over Real Sociedad to finish the year with a contained smile in their face. Cristiano Ronaldo scored the hosts' first two goals, while Lucas Vásquez debuted as a scorer for the club, setting the final score in 3-1 to Real Madrid. 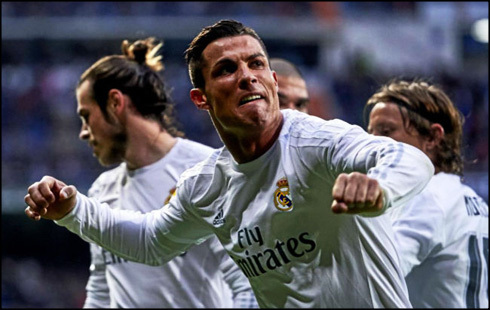 A brace from Cristiano Ronaldo and a late goal from substitute Lucas Vázquez was enough for Real Madrid to hold on for a 3-1 victory over Real Sociedad at the Santiago Bernabeu this afternoon. With the victory, Madrid briefly go top of the table, but both Barcelona (2) and Atletico Madrid (1) have games in hand. 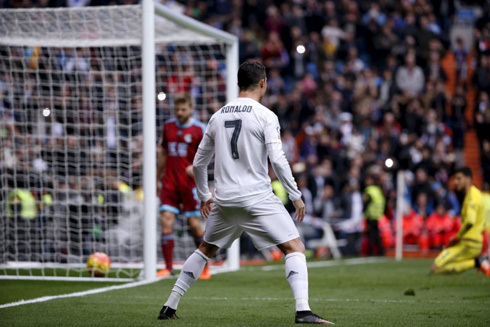 The game also presented an oddity - a missed Cristiano Ronaldo penalty in La Liga. His penalty, which admittedly came courtesy of a dubious call in the box when Karim Benzema went down, was skied over the bar in the 24th minute. 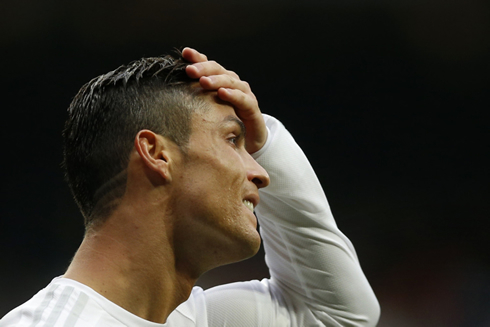 It was his first penalty miss in 55 tries and a dejected Cristiano Ronaldo simply turned away in disgust. Soon after however, he would get another chance, and this one he would convert. A handball in the box (this one was far clearer than the previous call), led to a penalty call and Ronaldo wouldn't miss it this time around, putting it to the goalkeeper's left and granting Madrid the much wanted lead. Still, Madrid looked entirely unconvincing and the Basques continuously pressed and presented trouble for the fragile Madrid defense. The danger man for the away side was the Portuguese winger Bruma, whose pace was too much for the troubled Danilo to handle. In fact and only four minutes after the break, Bruma would level the game with a brilliant strike into the top corner of Keylor Navas' defense. Soon after, Bruma would break free threatening to put Sociedad ahead, but some quick thinking from Keylor Navas saved Madrid's blushes and the boos began to descend even louder upon the Bernabéu. If Madrid ever needed a moment of inspiration it was then and it came from Ronaldo. A corner from Marcelo found CR7 running away from the goal at the edge of the box. Almost instinctually, he turned and laced a one time left footed strike into the bottom corner of the net. An insanely technical goal and perhaps the best from him this season. 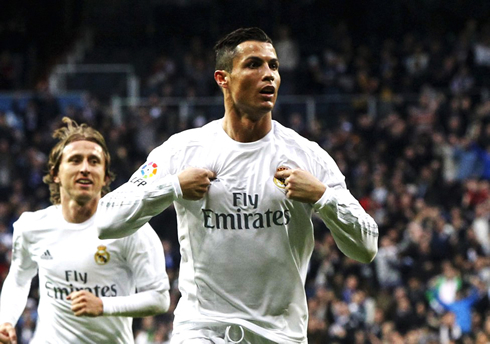 Ronaldo peeled off to celebrate, seemingly impressed by how well he hit it. Sociedad kept pressing, but Madrid looked to stifle the match. They would find a third after some brilliant interplay at midfield freed Gareth Bale to unleash a precise cross straight to the feet of Lucas Vázquez. 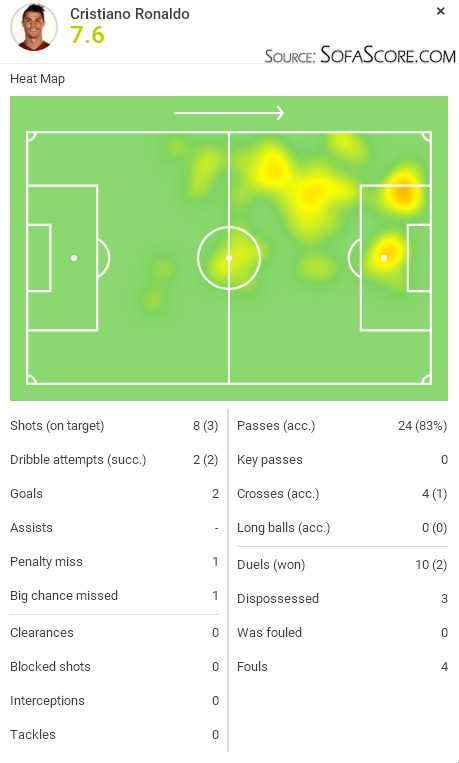 The former Castilla man, who has impressed every time he's stepped on the pitch this season, brilliant took the ball down and finished it. Real Madrid could finally breathe as the match was out of reach for the visitors. 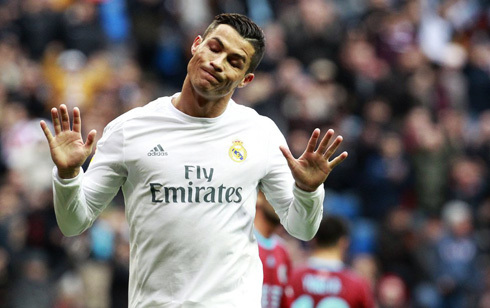 Cristiano Ronaldo next game will be for Real Madrid on the 3rd of January of 2016, against Valencia. You can watch Juventus live stream, Valencia vs Real Madrid, Barcelona vs Betis, Sunderland vs Liverpool, Arsenal vs Newcastle, and West Ham vs Liverpool, all matches provided from our soccer live game pages.